What is the Cross Border Xpress (CBX)? 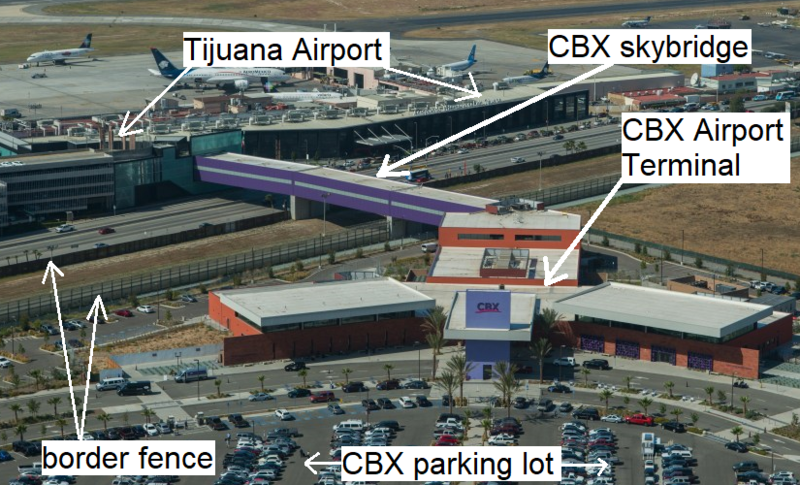 The CBX-Tijuana airport bridge is sort of a mini Tijuana airport terminal on the US border side with no airplanes, just airlines, and CBX employees where you can check in or buy tickets. The following information is also shared on a different page on our website. So imagine if Volaris, Interjet, Aeromexico, or Viva Aerobus could have a front desk on the US border side where airport passengers were able to check in and just walk across the border fence through a sky bridge that connects them right at the airport terminal. Well, someone with money thought of this, too. He built a bridge that connects airport passengers on the US side with the airport via a sky bridge. The CBX project is a private investment, and for that reason, you have to pay a fee. On your way to the airport, you will still have to deal with Customs and Immigration officers on the Mexican side. On your return, you will have to deal with US customs officers. So the passport booklet is required. If you have elderly parents, this is great for them and for you. It’s safe and secure. If you don’t want to deal with the traffic nightmare in Tijuana, this is a great option for you to get to the airport. You have to try it at least one time to make your own judgment. But based on personal experience and from comments received from thousands of customers who have used the CBX bridge to get to the airport, our conclusion is that this is the best option to get to the airport in Tijuana though San Diego. WARNING: Expect huge delays during the high season. If you want to avoid big crowds of people and delays, just don’t travel in the high season, otherwise, just relax and enjoy the experience. The ones like all of us at Delta Truck Parking who have to work while you are on vacation will appreciate your patience and understanding. Delta Truck Parking does not receive any type of compensation from CBX or have any type of business agreement with the CBX owners, agents, or employees. This is merely the opinion of the author based on personal experience and the collection of comments from Delta Truck Parking customers who have used the CBX service in the past. To learn more about the CBX service, click here to visit the official website for the CBX.